Testing your website speed and performance is important not only because it is a Google Ranking Factor, but because it affects usability, conversion rates, and bounce rates. Last updated: Jan 5, 2019. 10:21 UTC. 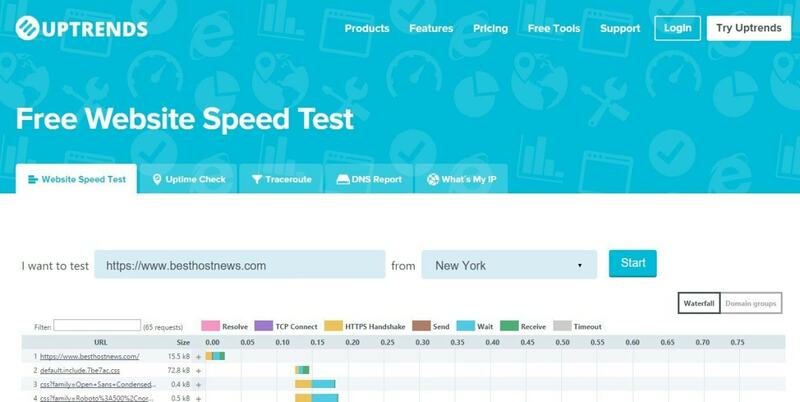 There are many different speed test tools to choose from, each with their own features and functionality. Many of the tools now reference the Google Page Speed Insights, and some tools give great explanations as to how you can improve your website speed based on the results. My personal preference is Pingdom Tools, and Google Page Speed Insights. That being said, we were impressed with Dareboost for how it explains the test results, as well as dotcom-monitor that allows testing from multiple locations at the same time. There is now a new website test from Google located at web.dev that is now my favorite web testing tool. I’ll update this article shortly to incorporate this new method of testing. 1. Why Carry out a Website Speed Test? In the context of this tutorial series, it is very useful to obtain a website speed test before installing W3 Total Cache. This allows you to see just how much quicker your website has become after completing the tutorial. Testing your website speed can also suggest other improvements such as image optimization, the need for a Worldwide CDN, or the need to remove problematic scripts or plugins. We will cover these in a related series at a later date. Investigating load time issues, including checking scripts, fonts, and plugins. Checking your Content Delivery Network is configured correctly. To fully understand your speed test results there are a few concepts that you need to know. Time to First Byte indicates the time it takes for your browser to start receiving information from the server after first making the request from the browser. A slow TTFB can indicate issues with your server, server configuration or server network. It may also indicate that the server is located some distance from your location as the browser request has to travel further. Choosing a server location close to your users, and using a Content Delivery Network can improve the TTFB. Unlike the Page Load Time, Page Rendering Time measures the time it takes for the webpage to be ready for the user to interact with. Some webpage assets, such as images, or scripts (such as social share scripts, Google Analytics scripts, etc.) will load after the page has begun to render. However, the user is still able to interact with the website while these are loading. Website speed test at Pingdom. © Screenshot. Just from this one example, it is clear that the total load time is not an accurate representation of our website speed. You can use W3 Total cache to prevent scripts from being “render-blocking”, and we will go into this in more detail later in the Tutorial Series. This reduces the size of the files that need to be loaded from the server, thus saving bandwidth and causing the files to load faster. Also, by using a CDN you can increase the number of simultaneous requests as the restrictions are per Hostname. By spreading the downloads over multiple hostnames allows for faster page load times. Also, HTTP/2 is now starting to be rolled out which do not have these restrictions. You can read more about HTTP/2 here (coming soon). 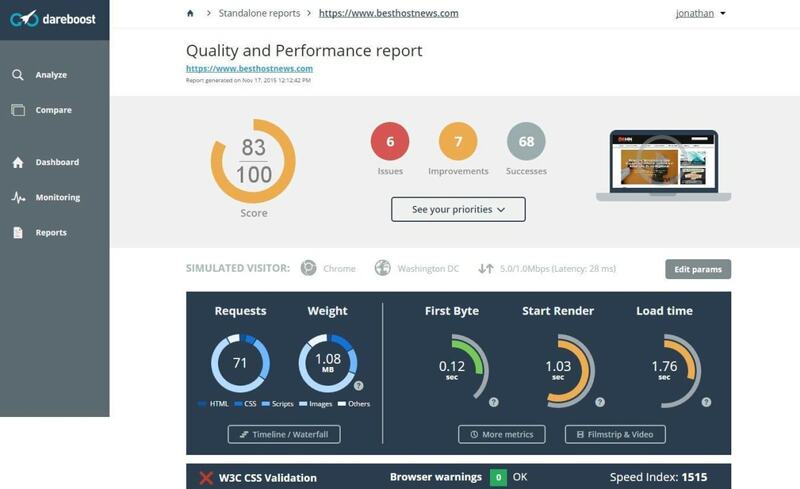 Therefore, when optimizing your website, you should carry out speed tests to determine the improvement in both webpage Load time and Render time after each optimization. Remember to clear your cache before testing, though! In essence, worry more about the speed, than the score. The score is helpful as a guide for “suggestions” only. Our favorite tool for measuring actual page speed is Pingdom Tools (see below), but many other tools are useful for giving insight also. Google PageSpeed Insights](https://developers.google.com/speed/pagespeed/insights/) is a service free by Google that measures the speed of your website for both desktop and mobile versions of your website. The score gives a range between 0 and 100, with the higher score being better. 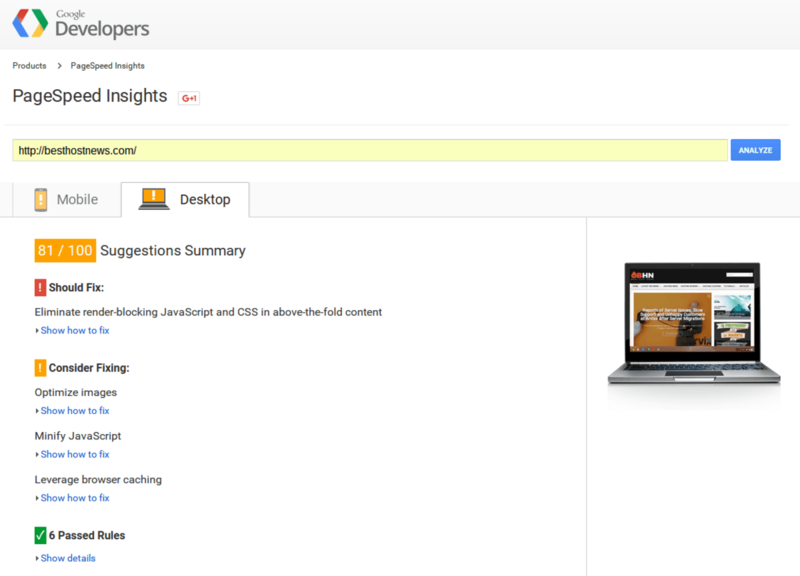 Google indicates that a score of 85 or more means the page is performing well. The report produced shows detailed recommendations and insights on how you can improve your PageSpeed score, along with an indication of importance. A mobile report includes the results of a Mobile Friendliness test, as this is now part of the Google Algorithm. This includes checking your viewport configuration, the size of your tap targets (buttons and links), whether buttons are too close to hinder tapping, and also eligible font sizes. The page analysis offers an excellent overview of additional information such as a size analysis, size per domain (you can easily compare your CDN assets size vs. your domain), the number of requests per domain, and what type of content had the most requests. Website speed test at GTmetrix. © Screenshot. PageSpeed and YSlow scores — The GTmetrix score is an average of the PageSpeed and YSlow scores. 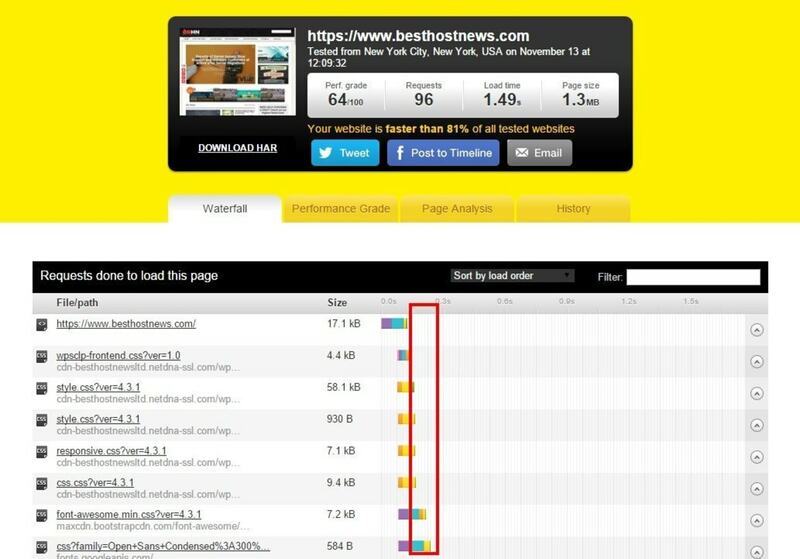 The arrow next to the score indicates whether you are faster than other websites analyzed by them. Recommendations — You will receive a full list of actionable recommendations, prioritized by importance \ potential gains. Page Load Details (time, size, the number of requests) — These give a great overview of your page speed. Also, the results are color coded so you can see how you compare with other websites. Waterfall, Video, and Report History — This allows you to see \ determine how your page assets load and troubleshoot any delays. The history allows you to see how any changes you make have affected the website speed. To get the most out of GTmetrix, we highly recommend you register with them for free. By doing so, you will get access to more features, including testing using different browsers, connection types (i.e. see how your website loads with a slower connection). One feature we particularly like is the video playback option. This allows you to playback your page load, at your chosen speed, so you can see precisely where any bottlenecks occur. Website speed test at WebPageTest. © Screenshot. WebPageTest was a first created as an internal tool for AOL, and subsequently made open source in 2008. As such the interface is a little more dated, and the speed of the test is a bit sluggish, especially if you get stuck in a queue behind other users. The things they test for is somewhat limited, and not as comprehensive as some of the above tests mentioned. 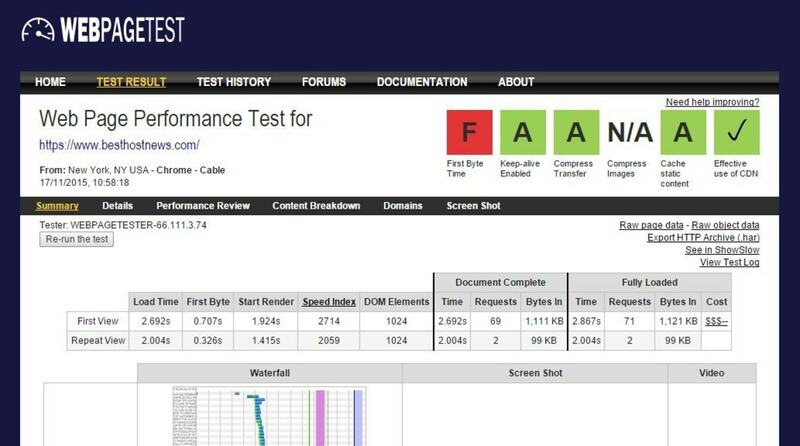 Website speed test at DareBoost. © Screenshot. DareBoost is one of the newer tools on the market, and having tested it for the first time while writing this article is now one of our favorites. You will need to register for free to make full use of the tool. Cache Policy — Checks for Expire Headers, inline script lengths, query strings on static resources, etc. Compliance — Checks for correct Font formats, Silverlight plugin usage, flash resources, etc. Data Amount — Checks for things like optimized images, minification, page size, etc. SEO — Checks for basic SEO matters, such as H1 tags, number of links on page, meta description, etc. Security — Checks whether you are protected against popular malicious web attacks, such as XXS attacks. It also checks SSL issues. Each test is given a score between 0 and 100 so you can get an indication of how well your website is doing. Website speed test at UpTrends. © Screenshot. Uptrends is a very basic speed test that allows testing from over 35 locations around the world. Waterfall — This enables you to see how the website resources load, and determine any problematic files. Domain groups — This classifies each resource as either 1st party, statistics, CDN, social, ads, first party overall, and third party overall. If you click on the resource, you can view the request and response headers, which is useful for checking caching, encoding, etc. We prefer Pingdom Tools over Uptrends as you get a much better summary. Website speed test at Dotcom-Monitor. © Screenshot. 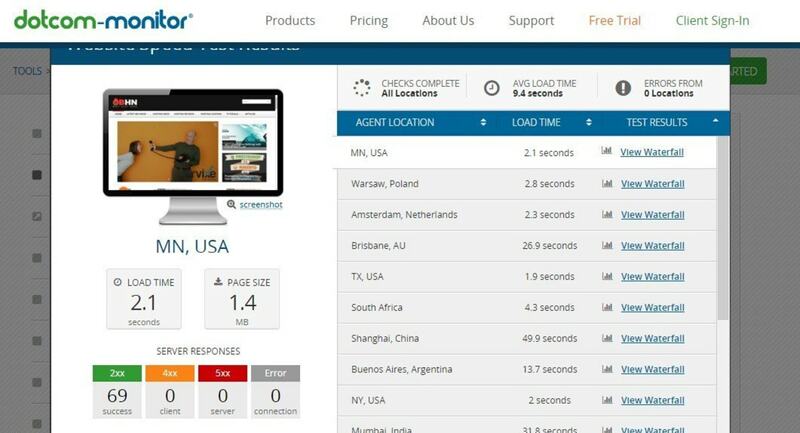 Dotcom-Monitor is a simple tool that offers the ability to test your website speed from 23 different locations simultaneously. You can also choose from multiple web browsers. The information is quite clear, but no recommendations for improvements are given. Website speed test at Yellow Lab Tools. © Screenshot. Yellow Lab Tools is a little different, with both good and bad aspects. Firstly it doesn’t give you a choice of locations from where it conducts the webpage test, and nor does it specify a location. If you click on any of the entries in the result, it will go into more detail and suggest where improvements can be made. Overall it does a fairly decent job at this.